Unfortunately, this product doesn't work and is on its way back to the manufacturer. I'm giving it a two star rating only because the manufacturer's customer service has been good so far. They have assured me that they will either repair or replace it. At this point, I would not recommend buying this monitor. I bought this a few months ago and I'm very happy with how it works, the memory it has for both my husband and my pressured+ the big and easy to read screen. While this product comes well recommended, one should make sure about the cuff size required. I'm an average size male and the medium size cuff is too small. Very good product and price is decent. Easy and precise. Excellent price too! Very accurate machine at a great price easy to use. Great product, it was bought as a gift. Easy to use, simple to understand, the price was great! Good product. Easy to use (not to many extras that I don't use) and does what it's suppose to do. Shipping was prompt. The only thing that stops me from giving it 5 stars is the absence of a battery eliminator. As it's 6 volts and most other products use 9 volt eliminators it was difficult to find. You would think that they could offer one as an extra cost option. 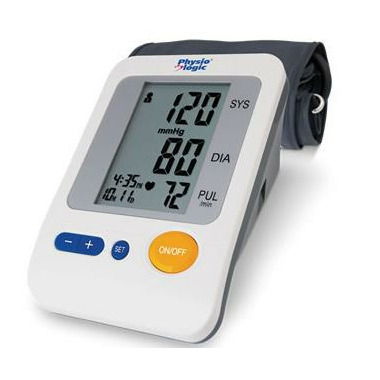 I bought this for my mom, and since she doesn't understand any english, I was aiming for a blood pressure monitor that would be really easy to use with a straightforward display. This didn't disappoint. And it comes with a sturdy little grey carrying case that makes it a lot easier to store and transport. Great unit! Easy to read screen and useful 'history' feature for up to 4 users. I also like the storage case with convenient carrying handle which keeps everything tidy. The delivery was really fast and efficient. Thanks Well.ca! Excellent product - couldn't have found anything better. Shipped promptly. Received a smiley on the packing slip :-) Easy to use. Great product, easy and simple to used, Well.ca also has fast shipping, I received my unit in a few days after order, and great price. liked the service of well.ca...product is fantastic! Great price for the quality and quite accurate! I have had 2 other monitors, and neither could compare to this one. Very accurate. Good product, the best price I found, The readings seems accurate. Good product for the price.......seems accurate, easy to use and large numbers make it ieasy to read. Also stores readings. Would recommend. After a health scare I decided it was time to have a heart monitor in the house. This model had good reviews at other sites and was in the price range we wanted to pay. The readings appear to be in line with blood pressure results from the doctor's. Excellent product, I have compared the accuracy with my doctor and we have the same results. very easy to use.